On June 11, a rally banana squared off against a rally llama in Nashville for the final game of a three-game series. The banana took the first game on a walk-off home run, but the llama returned the favor the next night with a walk-off of its own. After a back-and-forth Game Three, the bottom of the ninth arrived with the banana sporting a daunting three-run lead. The llama, determined not to see its season end here, charged back to tie and send the game to extras. The stadium rollicked against the night, sharp whistles punctuating cheers and celebrations. The momentum couldn’t last though; the madness came to an end in the 11th with the banana scoring four in the top of the frame. Welcome to the bizarro, do-or-die world of the college baseball postseason, where superstition and late-game heroics abound and where baseball is at its absolute best. By the end of the 64-team, multi-stage tournament, the best teams usually arrive for the final showdown in Omaha, but there are always upsets along the way. Take the rally banana, Mississippi State, from this year’s bracket. Originally a bubble team, whose two-seed in the Tallahassee regional was primarily the result of being an SEC team, the Bulldogs fought, scrapped, and mostly dingered their way past a Florida State team that was not only the No. 1 seed in that regional, but was also the No. 7-ranked national team, before moving past dangerous Oklahoma and Vanderbilt teams. The Bulldogs’ wild run, which ended one game short of the Championship Series, is emblematic of the win-at-all-costs style of baseball the college tournament creates. It’s the purest form of the competition: Every game matters, every out counts, and the depth of your pitching staff is often paramount to success. There’s no “let’s get them tomorrow” because by tomorrow it’s a new team also scraping for another chance to keep going. By tomorrow, elimination is just one bad pitch away. To me, that version of baseball, when stakes are at their highest and walk-offs are abundant, is the most entertaining to watch. It replaces the potential for drama with immediate tension. It showcases player personalities and outlandish managerial tactics, stretching the game to its limits. It deserves a place at the highest stage, in the majors’ postseason. 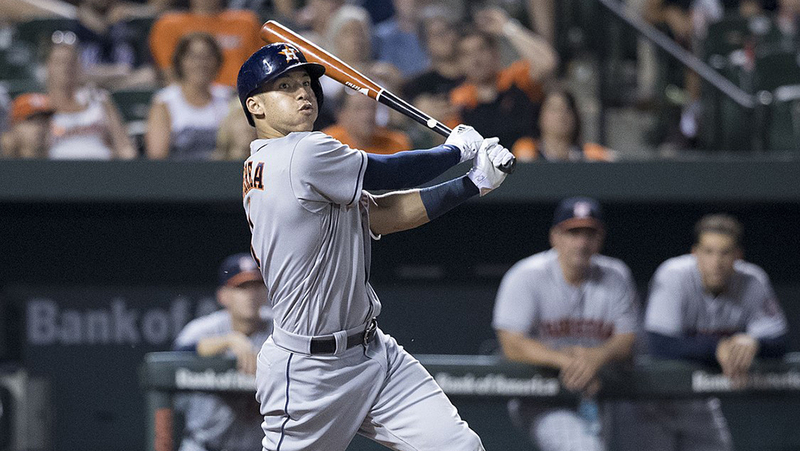 When looking at Major League Baseball’s October, there are no shortage of dramatic moments. There are plenty of iconic performances and game-changing blunders, but if you look closely, most of them happen in the World Series or League Championship Series. Rajai Davis’ home run to tie Game Seven against the Cubs? World Series. Bill Buckner’s error against the Mets? World Series. Curt Schilling’s bloody sock? LCS. Kirk Gibson’s walk-off homer despite no working limbs? World Series. I could go on, but you get the gist. Drama occurs in big moments, and big moments occur more frequently late in the postseason. For that reason, I would never suggest replacing the World Series or the LCS with a new format, because those stages are dramatic enough. The Wild Card game and Division rounds, however, could use a reevaluation. To start, boiling a 162-game season to a one-game playoff feels wildly unfair to both Wild Card teams. A double-elimination bracket would give that losing team a second chance. And while there’s nothing inherently wrong with the Division Series, it doesn’t strike me as quite right either. The matchups often seem lopsided and the results predetermined. Sure, there’s occasional drama, like the Nationals never making it past the LDS or the Reds blowing a 2-0 lead in 2012, but on the whole, the LDS registers as boring relative to the postseason’s other rounds. Two weeks ago, The Athletic’s Jayson Stark wrote about the possibility of MLB expansion and how it would necessitate a change to the playoffs. But baseball should not wait for two more teams to reimagine its October schedule. In fact, if it adopts a version of the college baseball structure first, adding two more teams would become infinitely easier later. The two leagues would each send six teams to the postseason, with divisions dissolving. It may seem radical, but baseball started without divisions, and other leagues — the NBA and the NHL — have modern precedent. By doing away with divisions, MLB would create a scenario in which each league can have a balanced schedule, in which every AL team would play each other the same amount of times and likewise for the NL. Interleague play would still be unbalanced, but on the whole, a balanced schedule would allow the six best teams in each league to make the postseason regardless of whether those teams happen to be in unusually competitive or easy divisions. The Yankees wouldn’t be punished by playing against the Red Sox more, nor would the Indians be rewarded for beating up on the AL Central. Also, by adding two additional playoff berths, tanking would be at least somewhat disincentivized. Fans like it when their team wins and when those teams make the postseason. If teams have a greater opportunity to play October games, it gives them more incentive to put a competitive product on the field, which also will draw more fans to the ballpark. It’s a win-win: Attendance becomes less of an issue for teams, and fans get what they want from their team — more winning. One of the biggest complaints fans have about baseball is the regular season is too long and ultimately amounts to little advantage at the end of the year. Division winners avoid the one-game Wild Card coin flip, but beyond that, there’s no real drive to finish best in the league versus third in the league. In this remodeled format, each league’s pennant winner would get an automatic bye to the League Championship Series. In other words, the regular-season standings would mean something tangible, a real advantage that would create incentive to win every game you can, be it in early May or late September. Here’s the bread and butter of this scheme. The World Series and LCS stay the same, maintaining their current best-of-seven form. The change comes in the Division Series, where five teams play in an eight-game, double-elimination series with a ninth game if necessary. The sixth team, each league’s pennant winner, gets an automatic bye to the LCS. 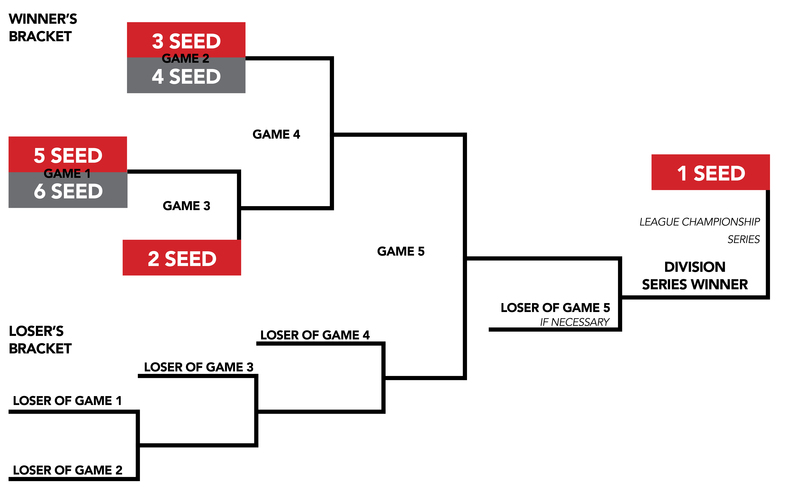 The opening round of the new Division Series is the vestigial Wild Card game with the fifth- and sixth-seeded teams playing each other, except the loser goes to a loser’s bracket instead of facing automatic elimination. The second round pits the third and fourth seeds against each other, while the winner of the new, first-round Wild Card game plays the second seed. The loser of the former plays the loser of the Wild Card game, while the loser of the latter plays the winner of that first loser’s bracket game, and the winners of the second round play each other. The Yankees, having won the American League pennant, would get to skip the Division Series altogether. It’s a massive competitive advantage that would prevent playoff-bound teams from coasting through September, because every win would still matter for their postseason hopes. Within the Division Series, the Indians (No. 5 seed) would play the A’s (No. 6 seed) in the new Wild Card game. Assuming the Indians win, they would go on to play the Red Sox (No. 2 seed) while the A’s drop into the loser’s bracket, awaiting the loser of the Astros (No. 3 seed) and Mariners (No. 4 seed). Let’s say the Mariners walk off the Astros, as is the Mariner way, and the Red Sox rightfully beat down the Indians. The Astros would play the A’s in an elimination game, with the Indians playing the winner in another elimination game. For the sake of simplicity, the Astros will win both elimination games in this hypothetical. 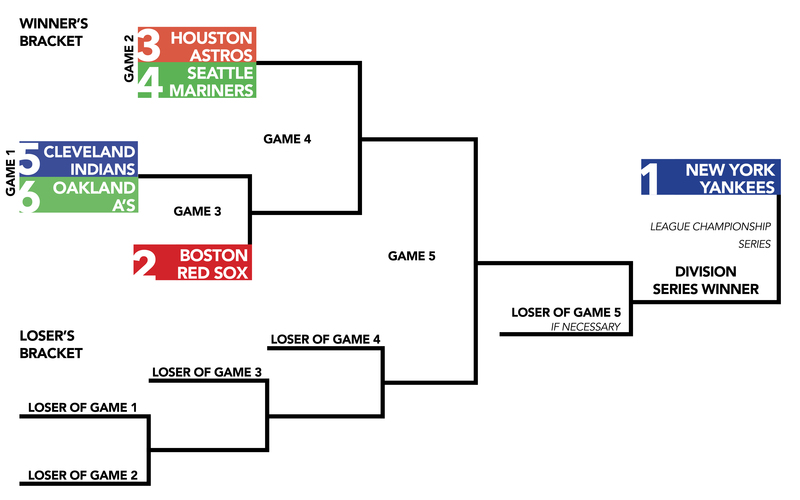 The Mariners and Red Sox would match up, with the winner gaining pole position in the bracket and the loser having to play the Astros in the final loser’s bracket game. 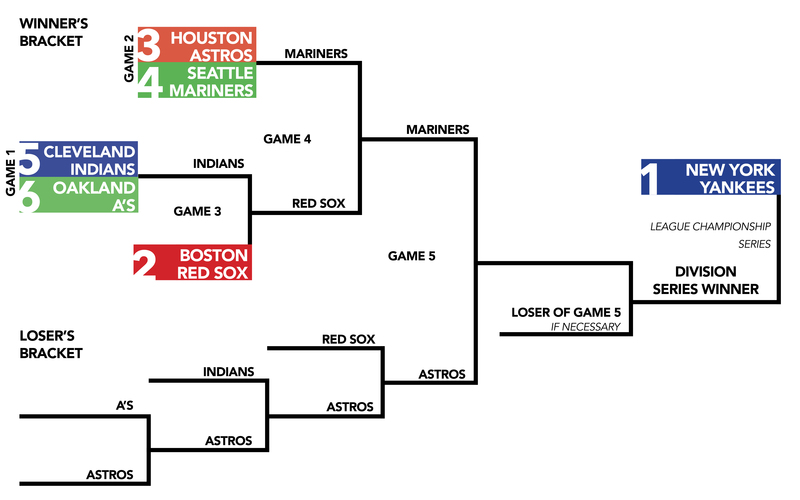 If the Mariners beat the Red Sox, that sets up a tantalizing Astros-Red Sox loser-go-home game in the first round of the playoffs. If Justin Verlander outduels Chris Sale, then the Astros face the Mariners again, needing to win two games to go to the LCS, with the Mariners only needing to win one. The beauty of a double elimination tournament is that every game matters. If the Mariners had lost the first game in this hypothetical, they would suddenly have to win five straight to make it to the LCS, as opposed to only needing to win three straight games from the beginning to move on. From the very first game to the final World Series out, the postseason has an outsized intensity. Losing the opening game puts teams at such a disadvantage that managers and players alike will be putting everything on the line to keep their season alive, every night of the postseason. At face value, that’s terribly unfair. But the desire to avoid that exact scenario is why this playoff-format works. If the hypothetical Red Sox had managed to win one more game and finish above the Yankees, then they would be playing either the fifth or sixth ranked team instead of the fourth, and if the Red Sox still lost, they would only have to win four straight to get to the LCS. Or even better, if the Red Sox had finished above the Astros, none of this would matter because they would be in the LCS from the start. Adding a double-elimination Division Series isn’t just about making the opening round more dramatic, but making the regular season more dramatic as well. If the whole thing just seems too complicated or the advantages seem too unfair for a postseason, there’s an easy fix: Add two expansion teams. With 32 teams, this double-elimination divisional format could expand into two four-team brackets per league, with the winners meeting in the LCS. It sheds the outsized competitive advantage of winning the pennant by making the No. 1 seed play in the divisional round but keeps the urgent, do-or-die form of baseball inherent to these kinds of brackets. Also, it pumps the percentage of playoff bound teams from the current 33 percent to 50 percent, which, if my math checks out, means more winning for fans. Fans don’t lose out on the number of games to watch either. While the current Wild Card Round and Division Series guarantees seven games with a maximum of 11 per league, this new format guarantees eight games with a maximum of nine. That’s a higher floor for assured playoff baseball but a lower ceiling on maximum of playoff baseball. The loss of the maximum is largely a moot point because since the advent of the Division Series in 1995, the maximum number of games for a league has been played only five times (2001 AL, 2011 NL, 2012 NL/AL, 2015 AL). On average, the NL plays 7.87 Division Series games and the AL plays 8.08. Add in the mandatory Wild Card game, and you have an average of around nine games per opening round, making the status quo not that different than a minimum of eight with a maximum of nine. 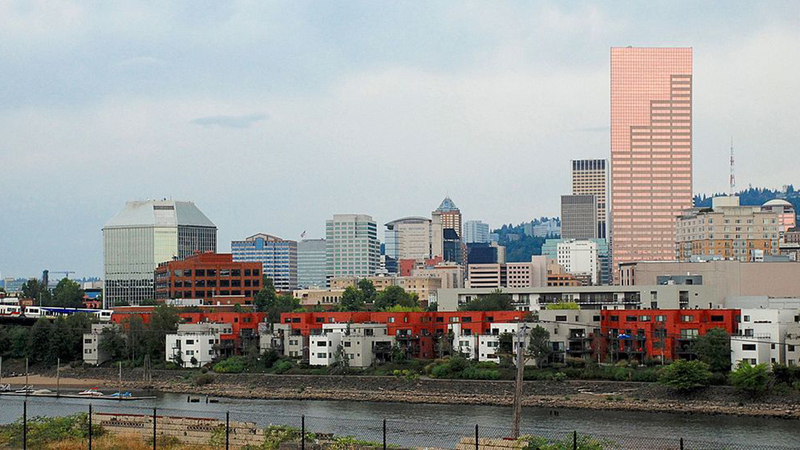 The most glaring logistical challenge to all of this becomes the golden rule of real estate: location, location, location. Where would all these games be played? Traveling back and forth across the country for one-off games makes for a massive waste of time and money for the teams, so that shouldn’t be an option. While the teams and league certainly have the resources to make that much travel happen, it feels excessive and unnecessary to me as a fan. Having the second-seeded team host the bracket makes sense and gives another incentive to finish higher in the pennant race, but it disadvantages fans of the other four teams. MLB could offer tickets in the style of the CWS or World Cup, allotting a certain amount of tickets for fans of each team but only for games where the host isn’t playing to maintain home-field advantage. It’s not a perfect fix, but it’s playoff baseball. People will travel. Or, the host site could be a neutral location in the middle of the country, say…Omaha? It would ease the stress of games being too early on the West Coast or too late on the East Coast and could become a traditional, storied, hallowed ground for the sport. Also, the most dramatic games will still occur in their home parks in front of the home fans. Carlton Fisk’s walk off is still waved fair in Fenway because it happened in the World Series. The existing College World Series’ T.D. Ameritrade Park is too small, but MLB could always build its own complex. “If you build it, they will come,” goes the line sent from above — perhaps a new field of dreams will bring fans back to major league baseball. The playoffs are engaging. The playoffs are dramatic. The playoffs are what make October great. But when any of those things are said, they usually concern the playoffs’ final stages. The Division Series is…sometimes engaging? The Division Series is…sometimes dramatic? The Division Series is rarely what makes October great. Changing the playoffs makes October more engaging and more dramatic and also increases the stakes of the regular season. During a 162-game slate, it can be hard to see how one loss in early May hurts a team’s playoff chances, but when every loss has an effect on how tough a team’s road to the World Series is, then even dropping a game in May stings. And later in the year, when the playoff picture has started to come into focus, those losses begin to feel even more monumental, as the mathematical certainty of seeding approaches. Each loss takes a team further from a guarantee in the LCS, each win pulls it closer. Even in an expansion scenario, fans would know that the difference between playing in the 1, 4, 5, 8 seed bracket or the 2, 3, 6, 7 seed could just be a single win. Late season baseball is dynamic already — think of the Mets’ 2007 collapse or 2013’s game 163 between the Rays and Rangers — but it can be made more compelling still. Replacing the postseason’s least dramatic round with a more fulfilling offering almost guarantees there will never be a dull moment. Teams that drop their first game have a desperate chance at redemption. There’s no third chance at that point. You either win or start looking toward next year. In a game that’s subject to luck and a great deal of variance over a single series, anything can happen in a double-elimination format. And that’s what makes the sport exciting — the madness, the superstitions, and the walkoff heroics that happen between the first pitch and the last. Instead of relegating baseball’s best postseason moments to its back end, let’s start the madness early. After all, the rally banana made it only to the college equivalent of the LCS. But college fans will never forget the show-stopping run they made to get there. Paragraph beginning ‘The Beauty…’ and the one after are repeated twice and the Astros and the Yankees are the wrong way round. I do like the idea though, but in the case of expansion i’d simply add a single elimination play-in game to bring the total to 14. Eliminate travel time / off days in the opening elimination tournament to discourage the reliever-fests that playoff baseball can become. Get the fields narrowed down to the LCS teams more quickly so we’re not playing November baseball as often. If the winner of the tournament is coming off 5-6 straight intense games and the league champ gets to rest up for a week (but not have like a 10-15 day layoff) before the 7 game LCS that’s a big incentive to go for the pennant. Interesting concept. Challenge is 14 of 30 teams makes it too much like the NBA. It also adds more playoff games, thereby devaluing regular season games even more. Lastly, the post season ends too late (November) as it is. Adding more time would make it even later/colder in the year and subject to even more weather (snow) availability. It’s not more playoff games. At 8 or 9 games, it’s more than the minimum if both LDS were swept (6), but less than the maximum if they both went the distance (10) . It is likely more time, however. Allowing for at least one travel day between rounds, and having to account for a possible 9th game (and a travel day after it) that would start the LCS on day 12 of the postseason. As opposed to 9? currently. This was a concern as I read. You can squeeze your format into a minimum of 6 days with no travel (so a single location is absolutely required), plus a 7th day for a potential game 163 if needed. I think the league championship’s benefit/advantage of time-off turns into a liability if they’re off for 7 days. 12 teams make playoffs with each league split in two divisions. Each Division winner goes into Divisional Series. Remaining four teams in each league play two out of three Wild Card to reach DS. Hard pass from me. I really do not care for NBA/NHL-style half the teams make the playoffs for baseball. The current Wild Card game is already way too gimmicky. I’m intrigued by the idea of incorporating some type of double elimination in theory, but certainly not before expansion. After expansion, honestly the NFL model still seems like the best. 8 division winners and 4 wild cards out of 32 teams. Make the first round best 2 out of 3. 2nd round best 3 out of 5. LCS and World Series 4 out of 7. You eliminated divisions, you have to come up with some name that doesn’t have “Division” in it! “League Challenger Bracket”? I haven’t worked the math but I think the dropoff in postseason position from #1 to #2 seed is too much, and doesn’t leave enough to create incentive further down. #2 has to win three games just to enter the series with #1. Same for #3 and #4, creating close to a ‘dead zone’. Biggest problem with the MLB playoffs are the start times. No kid on the east coast is going to see any late innning dramatics. I want this format! Now! If you don’t hate baseball then the playoffs are just fine as they are. So: not just no, but Hell no! This. The biggest problem I have with the idea is that the playoffs aren’t broken. Sure some series are clunkers, but we’ve had some of the best playoffs ever the past two years. How about making a real World Series with Japan, Korea, Mexico and Cuba represented by their champions? As other countries get better (if they do) they could be added to the mix? The soccer fans of the world with the World Cup have been laughing at baseball for years about the term World Series. America is not the world. But the gap between quality of play (DR) and market power would have to be addressed perhaps by MLB subsidising some Latin American clubs. I think Friedman means Club champions from those leagues, not national teams as in WBC. Intriguing idea. If the Divisional series were as compelling as the CWS, then certainly baseball would elevate itself back to the national pastime. Traveling to one site for the bulk of the post season playoffs would indeed build a new mystique. I love my baseball and watch it all season, but the prospect of upping the antee earlier is an alluring one.